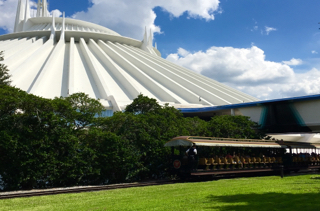 Space Mountain represents a "futuristic" type of attraction in Tomorrowland. As I was walking on the path between Storybook Circus and Tomorrowland, I noticed this photo opportunity presenting itself. The Roy O. Disney steam train was chugging by, which is the oldest "attraction" in Walt Disney World, built in 1916. I like the historic versus the futuristic aspect of this view.